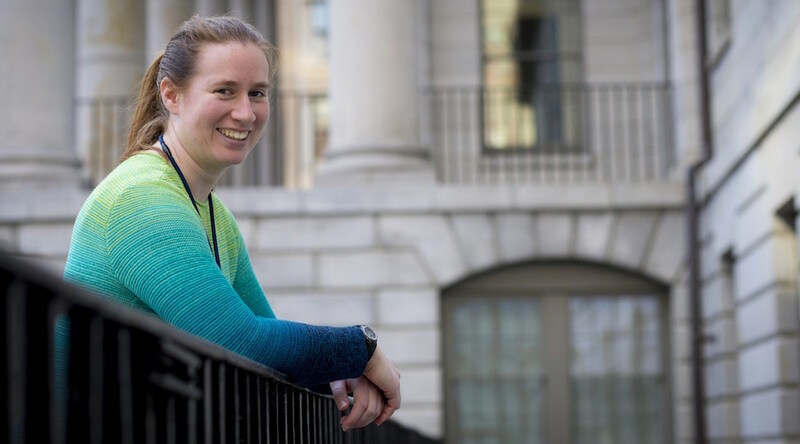 Zoe Todd is among the co-authors of a study that helps to explain how some of the earliest building blocks of life could have emerged from the stew of chemicals that existed on the early Earth. Photo by Rose Lincoln, Harvard Staff Photographer. A mixture of cyanide and copper, when irradiated with UV light, could have produced simple sugars that formed the building blocks of life on early Earth. This is according to Harvard graduate student Zoe Todd and Dimitar Sasselov, the Phillips Professor of Astronomy and director of the Harvard Origins of Life Initiative. In a paper published this week in the journal Chemical Communications, the researchers state that in order to make something like an RNA nucleotide, you need such simple sugars. Taking into account that past work from Sasselov’s group had shown that early Earth would have experienced a range of wavelengths shorter than typical on the planet’s surface today, Todd and her professor set out to test a system under those conditions. In detail, the scientists combined small amounts of cyanide and copper in an airtight quartz container — UV light can penetrate quartz — and then hit the solution with lower-intensity light from tunable xenon lamps. Using prisms, they were able to separate the light into different wavelengths and target the system with a specific wavelength for hours at a time before running tests to confirm the reaction was actually taking place. The results show that a similar process "was plausible on the early Earth,” Todd said in a university press release. The researchers hope that their findings open the door for future studies. "By adjusting the system based on specific conditions — which molecules are present in an atmosphere and intensity of the UV light produced by nearby stars — researchers could use the system to model whether the reaction could operate on other planets," Todd said.